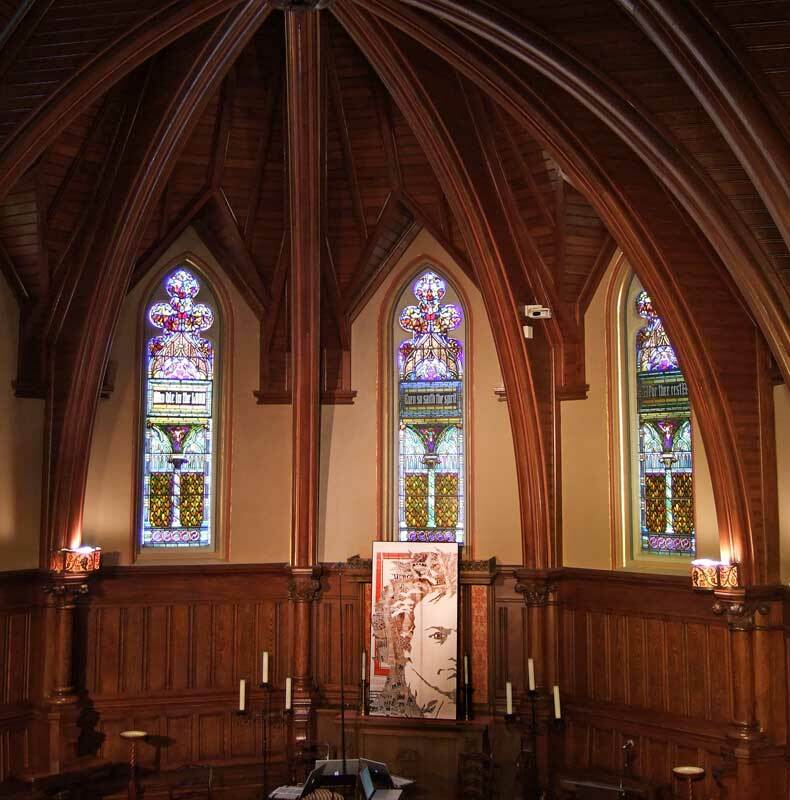 When Boston’s estimable Borromeo String Quartet is playing at its best, as it was in the Forsyth Chapel at Forest Hill Cemetery on Sunday, May 23, it is hubris to pen a critique of their performance. He also referred to Ivan Galamian’s wish that all string quartets perform from full score rather than parts. Now that the Borromeo uses computer screens instead of printed sheets this becomes possible without distractingly over-frequent page turning. For Haydn’s String Quartet in E-flat Major Op. 64 #6 (Hob. 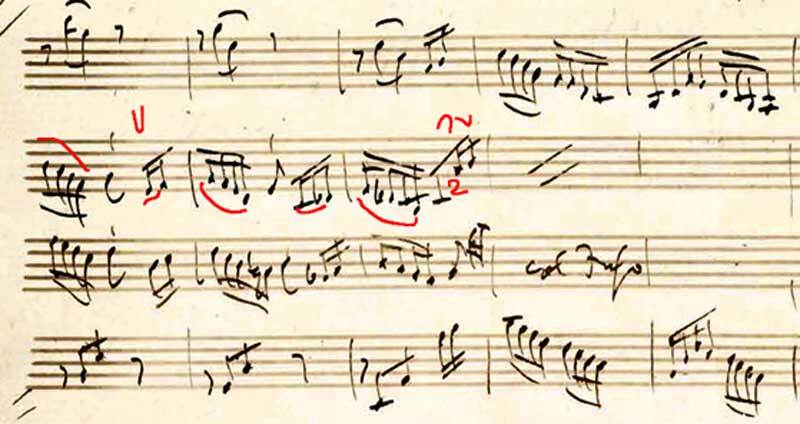 III:64), the group performed from PDFs of Haydn’s manuscript, which they were able to annotate electronically so as not to invoke the wrath of archivists. From the ur-text the delicious slides in the third movement could be seen as Haydn’s intention rather than mere performance accretions. In the illustration at right the results of Leopold Mozart’s advice and the quartet’s research are represented by Kristopher Tong’s annotations. The second half of the concert opened with a rapt interpretation of Ludwig van Beethoven’s String Quartet in G Major, Op. 18, No. 2. Through the chapel’s open windows one could breathe the fragrant air and hear the miscued bird calls. The program ended with “The Big Fuge” (Beethoven’s Grosse Fuge), Op. 133, a performance that was, for the first time for this philistine reviewer, a pleasure to hear. The Borromeo’s combination of energy and elegance is unmatched by any contemporary foursome. The members of the quartet are Nicholas Kitchen, violin; Kristopher Tong, violin; Mai Motobuchi, viola; Yessun Kim, cello. Nicholas Kitchen’s absorbing program notes are here. I didn’t attend this performance, but I did hear the complete set by the Muir SQ at BU. As a near-Beethoven-addict, I always derive pleasure from the Grosse Fugue….so much so, that I recently recorded a showing of the movie “The Mechanic” starring Charles Bronson. To my regret, the scene that involved the ‘GF’ was truncated. In the full-length version, it apparently runs the normal length. The opening of the ‘GF’ was a clue on the TV quiz show “Jeopardy” last week, part of the Tournament of Champions. These are people who not only survived the intial vetting process at “Jeopardy”, but had already become multi-show champions, returning for the quarter-million-dollar prize. Yet not one of the contest could identify the composer as Beethoven; one contestant blurted out “who was Paganini?” This may have cost him the grand prize because the payouts were closely matched. The wrong answer resulted in the subtraction of 1- or 2-thousand dollars, resulting in the potential swing of up to 4-thousand dollars. If he had known something about classical music, he might have won the whole shooting match. This happens all the time on “Jeopardy”.